Retail outlet that sells CDs and cassettes. Retail outlet that specializes in hair care and styling. Retail outlet that sells perfumes and beauty products. Retail outlet that sells undergarments and sleepwear for women. Retail outlet that sells articles made of precious metals and gems. Retail outlet that sells items made of leather. Retail outlet that sells the equipment and materials needed to renovate, install or fix things around the house. Retail outlet that sells pets and pet supplies. Retail outlet that sells items for giving such as dishes, decorative objects and toys. Retail outlet that sells children’s toys and board games. Area with a counter and tables where alcoholic drinks are sold. Establishment with auditoriums used for projecting films. Retail outlet that sells tobacco, cigarettes and smoking accessories. Retail outlet that sells designer clothing that is less expensive than made-to-measure clothing. Retail outlet that sells medication and hygiene products. Business establishment where meals are served for a fee. Retail outlet that sells books. Business that specializes in travel planning; the travel agency acts as an intermediary between the customer and the tour operator. Retail outlet that provides photography and development services and sells cameras and accessories. Retail outlet that sells electronic goods such as televisions, stereos and videocassette recorders. Pedestrian concourse that provides access to stores on a level. Installation for unloading and handling crates of merchandise. Business that specializes in making and selling keys. Kiosk where customers can obtain information on where to find stores and services in the shopping center. Business that sells bread, pastries and other goods that are usually baked on-site. Business establishment where beverages such as coffee and alcoholic drinks and light meals are served for a fee. Business that serves rapidly prepared food at an affordable price. Retail outlet that sells sports articles such as sportswear, equipment and accessories. Retail outlet that sells footwear and related accessories. Outlet where mail is processed and various postal services are offered to the public. Retail outlet that sells newspapers and magazines. Long narrow unupholstered seat with or without a back, seating several people. Small booth equipped with an automated camera that takes fast-developing photographs. Machine used to obtain money using a debit card. Retail outlet that specializes in cleaning and pressing clothes. Retail outlet that sells eyeglasses and contact lenses. Babysitting service provided while parents do their shopping. 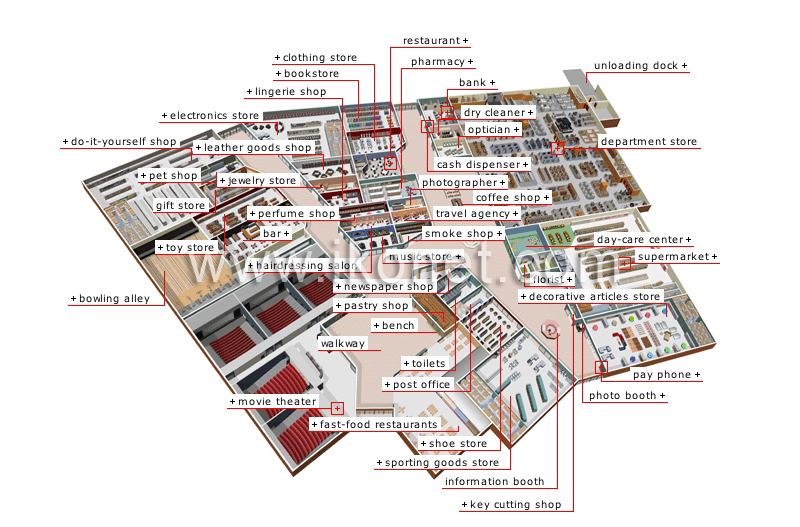 Large store with sections (departments) for various product categories such as clothes, stationery and cosmetics. Retail outlet that sells furniture and interior design accessories. Retail outlet that sells flowers and ornamental plants. Large self-service retail market that sells a variety of food and household products.